When we're with the ladies of The Runaways there's a lot of glum attitude and druggy malaise on display, so thank God for Michael Shannon as their Svengali producer Kim Fowley, who electrifies the movie like the lightning bolt that's often painted on his face. It's Shannon's most high-profile part since snagging an Oscar nomination in Revolutionary Road, though since then he's made Werner Herzog's My Son, My Son, What Have Ye Done and will soon be seen in Jonah Hex and the HBO series Boardwalk Empire. In real life, Shannon couldn't be more different from the wild lech he plays in The Runaways. Serious but also seriously funny, the actor sat down with Movieline last week to talk about working with all those young actresses, working in front of a camera in general, and working with the mysterious James Franco. I interviewed Werner Herzog a few months ago, and he said you were his favorite actor right now. Then I interviewed James Franco at Sundance, and he said the same thing. 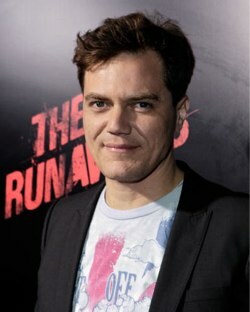 So I guess my first question to you is, what kind of charm offensive do you have going on here, Michael Shannon? [Laughs] It's the fruit baskets. No, that's wildly complimentary, to hear that from those two people. I made two movies that I really loved with both of them, a short film with James called Herbert White that was at Sundance, and of course, Werner I worked with on My Son, My Son. They were both great experiences. I don't know why I have this great fortune of being so admired -- I just show up and do the best I can. I guess I can kind of understand what they're going for sometimes. Maybe that kind of helps. You already knew what Werner was going for, I'm sure, since he'd brought you on to do a few days on Bad Lieutenant. Yeah, that was interesting. In a way, it was kind of like an...I don't know if "audition" is the right word, but he was like, "Come do this part on Bad Lieutenant, and then we can figure out whether [My Son, My Son] will work or not." So I said OK. Doing Bad Lieutenant was fun, to do those scenes working with Nic Cage. Man, that was awesome. He really went for it in that movie. You really go for it in The Runaways. Do you ever fear you're going too over-the-top, or is that even possible when you're playing someone like Kim Fowley? Yeah, you gotta look at the source. There are some people that are more animated than others. There are some people who are able to sit still and hardly move and some people that are all over the place. That's the panoply of life, I guess. Is that how you say that word? But you know, I guess one thing that might be why Werner and James said those things about me is that I'm really quite obedient to the director. I'm not belligerent, really; I kind of do what I do and look at them and say, "Are you happy?" If they're happy, then I don't really think much about it anymore. I feel like films are a director's medium. The director is the one who really has the hardest job on a movie, I think, and has the most responsibility for how it turns out. So you're not the kind of actor who watches a film afterward and thinks, "Why did they cut that scene? Why did they use that take?" Oh God! I can't even remember the takes after! I have a lot of respect for directors. I think directing a movie is one of the most difficult things you could choose to do in the arts, because it just never ends. I mean, it's so much work from before you even start shooting to photography to post-production. They probably sleep about three hours a night for about four months. I really feel like it's their vision, and if you can realize that, then why not? Do you feel like you're doing comparatively little work as an actor? No, I'm not saying it's easy. It's not easy to act in front of a camera -- my Lord, no it's not! It takes a long time to get used to if you're used to acting on stage. I guess there's some people like Steven Soderbergh who goes out and gets people who've never acted before and puts them in front of a camera and it's no big deal, but I guess that's probably because it's not their art form or whatever. They're just there, and it's like "What do you want me to do?" I guess that's what it boils down to, "What do you want me to do? It's your movie." "When we’re with the ladies of The Runaways there’s a lot of glum attitude and druggy malaise on display..."
Was that necessary? It comes across as a wounded journalist who needs to throw in a jab at people because he perceived them in a way that offended him. Sadly, what could have been a fascinating article started off in a childish tone. I'm talking about the characters in the movie. He seems great, almost iconic already. In that shot from the movie he looks like Ray Liotta, which is nice. I get a Walken/Dafoe vibe from him. Hope The Runaways will get a release out here. A peck of March dust is worth a king’s ransom. Wow, amazing weblog structure! How lengthy have you been running a blog for? you made running a blog look easy. The entire look of your web site is excellent, as neatly as the content material!